The redevelopment of Harvie Passage on the Bow River at the Western Irrigation District weir in the heart of Calgary will be complete and open to the public later in the spring of 2018. The Low Flow Channel has been designed as a safe passage through the weir for all paddle sports and offers a destination water park for kayak and canoe use. 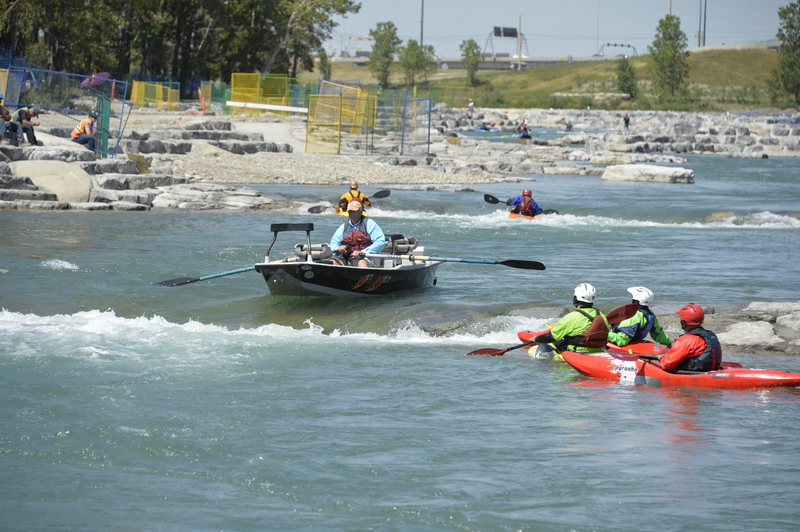 By all accounts the recreation and competitive paddle community are happy with what has been developed by the Government of Alberta. What is unfortunate is that the Government of Alberta and the City of Calgary have been unable to resolve convenient access to Harvie Passage. As it stands now, no improvements to access infrastructure will be made for the foreseeable future. For Bow River Trout Foundation as a member of Calgary River Users’ Alliance a further frustration is that a boat ramp has been built into the tail-out of the Harvie Passage Low Flow Channel without any consideration for how to access the site with a truck and trailered drift boat. The document A Boat Ramp to Nowhere – A Proposal for Access to Harvie Passage was sent to Councillor Gian-Carlo Carra who represent the ward adjacent to Harvie Passage on December 18, 2017 outlining two proposals that we believe are feasible to resolve the access issue. It was hoped that our initiative would kick start dialogue within City Council to find a resolution to river access at this site. Unfortunately there appears to be little appetite to engage in the process to achieve a satisfactory river access outcome for all river users. Once Harvie Passage is opened, the paddle community will be limited to parking at the Bow Habitat Station and carrying their water craft across Pearce Estate Park. For the fishing community we will only be able to look at the “Boat Ramp to Nowhere” and wonder just what could have been done with a more creative thought process. Wait, so they spent all this money fixing Harvie Passage but there still isn’t a place to park beside the features? That doesn’t make any sense. I hope the families who are at the park for picnics don’t mind a bunch of extra people taking up parking spots and changing their clothes there to participate in water sports…. I hope the city gets on this and allows parking closer to the river features.